iCivics yesterday announced the launch of NewsFeed Defenders, an online news literacy game created in partnership with Annenberg Public Policy Center, the folks who bring us FactCheck.org. 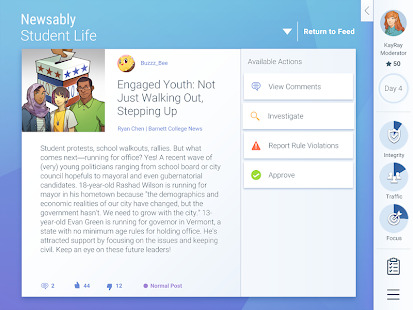 The Serious Game was developed by Filament Games, who has a longstanding partnership with iCivics and their mission to make civics education accessible for all. The flood of fake news, propaganda, rumors, and advertising that often masquerade as news has made it harder than ever to separate fact from fiction. News Literacy can help students of all ages recognize the differences between fact and rumor, news and advertising, news and opinion, and bias and fairness. This 21st-century problem requires an innovative solution that challenges people to learn news literacy skills while understanding their place as agents of factual information (Source: Center for News Literacy). 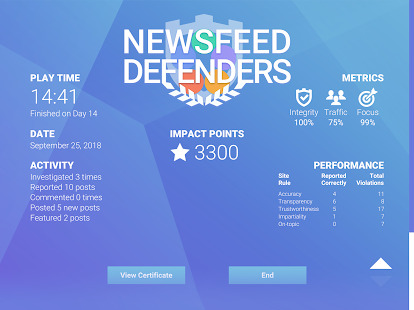 NewsFeed Defenders invites players to tackle this 21st-century problem head-on. 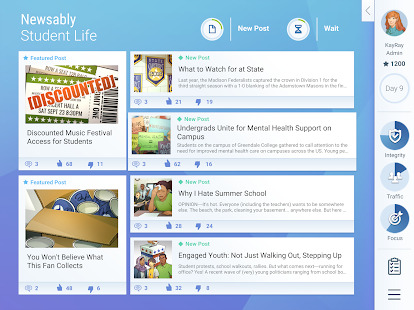 Created for secondary school students through adults, the game puts players in charge of the news aggregation site Newsably. 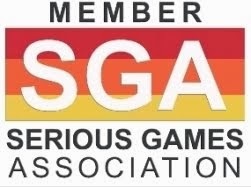 Their mission: to protect the integrity of the site while also attracting new readers, and meet the challenge to level up from guest user to site curator. 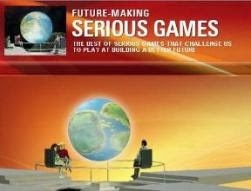 The game gives players a look behind the headlines by teaching them how to spot so-called fake news, or viral deception; how to know when advertising is posing as news; how to identify bias in stories based on word choices and how the story is framed; how to apply journalistic standards, verifying information and images; and how to become a more astute reader of online news. Available free online or download the app from the App and Google Play stores. Read more about the NewsFeed Defenders game and the partnership between iCivics and Annenberg Public Policy Center in the full press release below! NewsFeed Defenders from iCivics and the Annenberg Public Policy Center teaches students and adults to differentiate between what’s real and what’s not by challenging them to moderate an online community news site while resisting clickbait, viral rumors, and biased sources. CAMBRIDGE, Mass., and PHILADELPHIA -- iCivics, the education nonprofit founded by Sandra Day O’Connor, and the Annenberg Public Policy Center, home of FactCheck.org and Annenberg Classroom, have released a new video game designed to teach media literacy and help both students and adults better understand what news is, and how they can avoid being deceived by misinformation. Designed to help make sense of today’s chaotic media environment, NewsFeed Defenders is an online simulation that teaches players to detect and disregard disinformation and misinformation on the web. Created for secondary school students through adults, the game puts players in charge of the news aggregation site Newsably. Their mission: to protect the integrity of the site while also attracting new readers. In addition to juggling member traffic and maintaining community focus, players must ensure that the content they post is, in fact, news. That means learning to tell when posts are actually ads disguised as feature stories or viral rumors presented as news. So, even though that headline about the President adopting an alien child might catch eyes, players don’t want to post that story -- if they want to maintain a credible news site. The game, which is being released as midterm election season heats up, leverages the strengths of the Annenberg Public Policy Center and iCivics, nonpartisan organizations that worked together previously to develop four games. NewsFeed Defenders is available free on the web and as an app for tablets through iTunes and Google Play. Founded in 2009, iCivics is a nonprofit organization committed to transforming civic learning through effective and inventive resources. iCivics was founded by Justice Sandra Day O’Connor to develop free educational video games and lessons that teach young Americans to be knowledgeable, curious, and engaged in civic life. iCivics’ game-centered curriculum provides students in grades 4-12 with the tools they need for active participation and democratic action. Today iCivics’ innovative resources are used by nearly 180,000 educators and more than 5 million students nationwide, making iCivics the largest classroom-based digital civics educational resource in the country. For more information, visit www.icivics.org.